Let me show your buyers what it feels like to live there through state-of-the-art real estate photography and digital imaging. 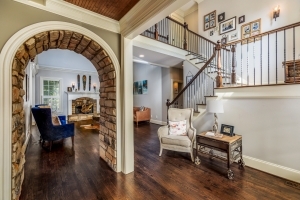 Whether you are a real estate agent, builder, interior designer, architect, homeowner or property manager, I offer several options based on your specific needs and budget. Get it right the first time and hire an award-winning photographer with over a decade of experience! Serving Troup, Harris, Meriwether and Muscogee Counties and: LaGrange, West Point, Lanett, La Fayette, Pine Mountain, Opelika, Warm Springs, Manchester, Waverly Hall, Hogansville, Valley, Cusseta, Columbus, and surrounding areas. If your location is more than 30 miles from West Point, GA, a small travel fee may apply. My real estate photography packages are designed for clients looking for the highest-quality real estate images. By blending the available natural light with a touch of off-camera flash, images look realistic and natural with good color accuracy and enhanced window details. This “flambient” technique works well for all properties, and it is especially well-suited to higher-end houses with spacious rooms and open floor plans. Number of images may vary slightly based on the size and layout of the property. Time on site ranges from 1-3 hours. Images are delivered in MLS-ready format through a Dropbox account, often on the same day! All packages include a one-year usage license for property and agency marketing purposes. Homes over 3700 sq ft or Commercial properties – Please contact me directly in order to receive an accurate quote and estimated time for completion. These are taken during your scheduled appointment with a 12′ camera mast to provide that unique elevated view without the need for full drone services. Approximately 3-7 images depending on the property size and layout. Twilight Images – $125 for 5 images. Great for showcasing beautiful landscape & water feature lighting with warmth and vivid color. 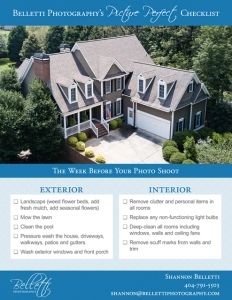 As a courtesy, I have created a pre-shoot checklist for agents & sellers to help you prepare for your real estate shoot with Belletti Photography. Appointments are typically booked “back-to-back,” and preparation prior to my arrival will ensure you get the most photographs taken during your appointment time. Please feel free to download the Pre-Shoot Checklist and share as needed. I look forward to working with you!